This giant catfish caught in May of 2005 was 9 feet long and weighed 646 lbs - more than 5 times the size of the world record catfish caught in North America. It's official! 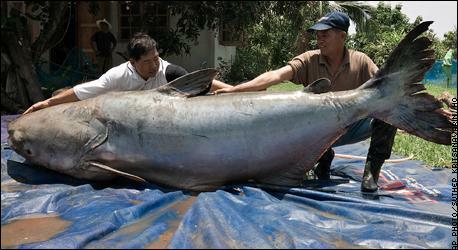 The new world record holder for the biggest freshwater fish is the Giant Mekong catfish (Pangasius gigas). The biggest one ever captured and measured was caught in Thailand in May of 2005. It was 9 feet long and weighed 646 pounds. The fish in the photo was captured by some fisherman where the species is considered endangered, but can still be caught with special permits. The fish was turned in to the Department of Fisheries where the eggs and sperm are collected from these rare giants and harvested for a captive breeding program to keep the species alive. This giant catfish inhabits the waters of the Mekong River in China, which flows southward into Southeast Asia. This fish is found as far south as Cambodia and Thailand where it is known as Pla Buk, which means simply "huge fish".The dimensions of these catfish are very impressive, with the largest supposedly growing up to 10ft/3m and weighing up to 660lbs/300kg. Scientists have recently discovered something amazing about the Giant Mekong catfish; they live out part of their lives at sea. Most people have the impression of catfish as slow, lumbering bottom-feeders, but it turns out that the migration routes of these catfish rival those of the better known salmon. Scientists have recorded Pangasius gigas traveling as much as 600 miles (1000 km) inland from the south China sea up the Mekong River to spawn. The waters of the Mekong River are very murky and make it difficult to track the movements of the fish. In order to determine where the Mekong catfish have been, scientists examined chemical markers called isotopes in bone and muscle tissue of catfish from the Khone Falls region of the Mekong. The team found evidence that the freshwater-dwelling fish had migrated recently from a marine habitat. Although this method of fish tracking is a highly regarded method, it appears that this is the first time it has been used to track the migration routes of river catfish species from a marine environment. The recent discovery that Mekong catfish are anadromous, (moving from coastal waters into fresh waters to spawn) has surprised even scientist's long-held notions of freshwater species. It may be that many other species of catfish also have similar migration habits, and that other species of freshwater fish may be found living part of their lives at sea. It certainly gives new meaning to the concept of "freshwater fish", if they spend part of their lives living in the salty waters of a marine environment. As big as the Giant Mekong catfish can get, there are rumored to be other species of freshwater fish whose dimensions rival those of the Mekong catfish. Among them are the Arapaima and huge freshwater stingrays, both found living in the Amazon River. The giant Chinese paddlefish is also a serious contender for world's biggest freshwater fish, but very little is known about this species that seems to be rapidly disappearing. For more information about giant freshwater fish species see the National Geographic sponsored Megafishes Project, and meet the scientist who travels the world looking for the world's biggest freshwater fish. We need your vote to help us qualify for a $250,000 grant. Click here and enter 'Extreme Science' to cast your vote.